by Martin Malden on 22 July, 2009. Last updated on 28 December, 2018. I’m often amazed when I look at the source code of web pages, because creating a page that’s optimised for the search engines is so straightforward – yet so seldom done. I’ve said repeatedly: Search Engine Optimisation (SEO) is not a black art, so don’t let anyone tell you it is. All you need to know about SEO is readily available on-line – and Google Webmaster’s Tools is a great place to start. On-page SEO, the way you construct your web pages, is more of a one-time exercise than off-page SEO – although it does require some maintenance, particularly if you change the content or focus of your site. Off-page SEO is not complicated, but it does require a continuous effort. This article looks at how to structure a web page effectively – on-page SEO. Your META tags. This is data that sits in the header area of your page and is specifically designed to tell the search engines about your page: how often they should visit it, whether or not they can index it and so on. The search engines will naturally look for META data whenever they visit your page. Tags within your content. This is information that’s contained within HTML tags in the content you write. It’s designed to give the search engines information about things they can’t read (images, for example) and let them know about information you consider to be important – headers, sub headers, bolded text and so on. Your content itself. The search engines can and do read this. As I mentioned elsewhere, it won’t be long before the search engines can assess the quality of spelling and grammar on a web page, and they may well start prioritising pages accordingly. So let’s take each of these in turn. This is an image of the page source of the header section of one of my sites. The META tags go in the header area – the bit between the HEAD and /HEAD tags (circled above) which, themselves, sit between the HTML and BODY tags, (1 above). These tags give information to the search engines about your page, what it contains, who wrote and designed it, how often they should visit and so on. All I did to create the META tags in the first picture was to fill the answers to the questions into the fields on the right of the second picture. I then clicked the ‘Create Meta Tags’ link at the bottom and pasted the resulting code into the page between the HEAD and /HEAD tags. You can find this META tag generator here. That entire process will probably take you around 10 minutes, depending on how long you take to fill in the answers to the questions. The tags within your content give the search engines information about content you consider to be important or content they cannot read – such as images. The content you consider important is defined by the H tags, and these are no different to the ‘header 1’, ‘header 2’ and ‘header 3’ paragraph definitions in Word. Usually your main headline for the page would be your ‘header 1’ paragraph in Word or, in a web page, would be the words between your H1 and /H1 tags. 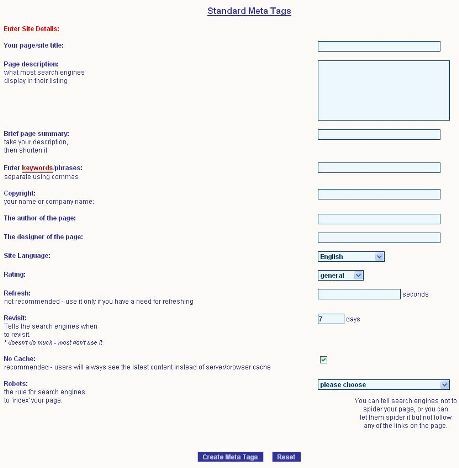 Sub paragraphs (header 2 and header 3 paragraphs in Word) would be the words between H2 and /H2, and H3 and /H3 tags on a web page. You should use these tags to define headers and sub-headers within your content. Not only will this make it easier for readers to understand what your page is about, it will make it easier for the search engines too. The other principle tags to use within your content are tags to tell the search engines what your pictures are about. These are the alt tag, which defines the text that will be displaid if, for any reason, the image cannot be, and the title tag, which tells the viewer what your picture is about when they mouse over it. Both of these tags are readable by the search engines, whereas the images are not. These tags give the search engines what may be important information, especially if you’re using an image to make an important point within your content. As long as your page is focused on one subject (which, generally, it should be) your content will naturally contain relevant keywords. An important message here is to write for people. Don’t stuff keywords into your text in order to attract the search engines or achieve some keyword density target. It will read unnaturally, with the result that it won’t impress people. And it won’t impress the search engines either. However, it is worth finding a way to incorporate your main keywords into the H1, H2 and H3 content. Remember, these tags tell the search engines (and readers) what you consider to be important. So getting your main keywords into these tags is a good way of letting the search engines know what your page is about. It goes without saying that these should all be tightly focused. In other words, keywords that you define in your META tags should be completely in sync with the words you use in your H tags and the content of your page. As such, you should be writing your page content first and refining that. Once you’re happy with the content you can define your META tags and H tags. For other articles that I’ve written on SEO, click here. This is a very informative post; lots of great tips that I’ll definitely use! Thank you! One question, is there a certain amount of ‘blog tags’ you should use?? Will Google penalize you if you use too many? .-= ChaCha Fance´s last blog ..BuyDig.com – The Internet’s Digital Superstore =-. If you’re talking about META tags then you don’t want to use too many. I generally restrict myself to no more than 10 per page, often less. Remember that you’re setting META tags on a page by page basis and you want to keep all information associated with a page focused. If you’re talking about post tags there are other articles on here that address that. Just do a search for ‘tags and categories’ and a whole bunch of articles will be returned. Yes I was talking about post tags. Thanks! .-= Charnita Fance´s last blog ..BuyDig.com – The Internet’s Digital Superstore =-.